Hopes and Challenges of Global Ministry – North American Baptists, Inc.
As we enter February, Kerry Bender, interim VP of International Missions, shares his heart on the hopes, dreams, and even challenges we are facing when it comes to global ministry. Join us this month as we explore these ideas. Join us in praying for International Missions within the NAB and celebrate with us as we share our excitement about what God has in store! It is with deep appreciations for his years of service to the NAB that we announce that Bob Klein, the regional minister for the SoCal Association, retired from his position as regional minister at the end of 2018. These past three years, Bob has led the churches in southern California with care. In reference to Bob’s recent departure, Mike McNeff, the NAB moderator and the pastor of RockRidge Church in southern California, said, “His service to the NAB extends through his entire ministry career. He was a servant leader before the term became popular because he has always led with the heart of Jesus. We will miss him at our SoCal gatherings, but we know that his prayers for us will continue and, since he is still in southern California, we expect to see him from time to time.” Join with us in celebrating Bob’s service as regional minister and praying for all that God has in store for him in the years ahead. 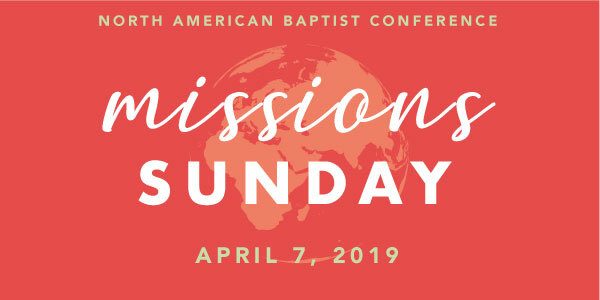 As the NAB partners with God where He is already at work all around the world, we invite you to take part in Missions Sunday on April 7, devoting part or all of your worship service to highlighting your church’s global missions efforts as well as receiving an offering in support of NAB’s Global Missions Fund. Let us join together as one to celebrate what God has done and rejoice in the ways He will move in the year ahead. Keep an eye out for resources to assist your church, including videos from missionaries sharing how God is at work in Cameroon, Brazil, East Asia, Japan, Latin America, Hungary, and Romania. Jeff and Sonya Kilmartin, NAB Missionaries in Cameroon.For about a decade, Jeff and Sonya Kilmartin have fostered a connection with some of the Fulbe people in Nigeria. Now that they are back in West Africa, where Jeff holds a position teaching at the seminary in Ndu and Sonya is teaching English classes, they have made multiple forays into Fulbe communities, including five weeks staying in a Fulbe village in Nigeria. Upon their return to Cameroon, they were redirected to Banyo, a city in a safer part of the country. Continue to pray for the ongoing and escalating unrest in Cameroon, focused in the Anglophone section of the country. For more information, visit nabonmission.org/missionaries/jeff-sonya-kilmartin or check out their blog at www.kilmartinblog.wordpress.com.